After seven chaotic and violent hours, quiet returned to the Gaza Strip overnight. Yet on Saturday, civilians in the Palestinian enclave and Israel remained fearful of the potential for a new war. The fatal shooting by a Palestinian of an Israeli soldier during protests along the border Friday sparked a widespread wave of Israeli bombing, with three fighters from Gaza's Islamist rulers Hamas killed and dozens of targets struck. After intensive indirect mediation by the United Nations and Egypt, a truce came into force at midnight, yet both populations remained on high alert of another all-out conflict between Israel and Hamas. "War is coming. 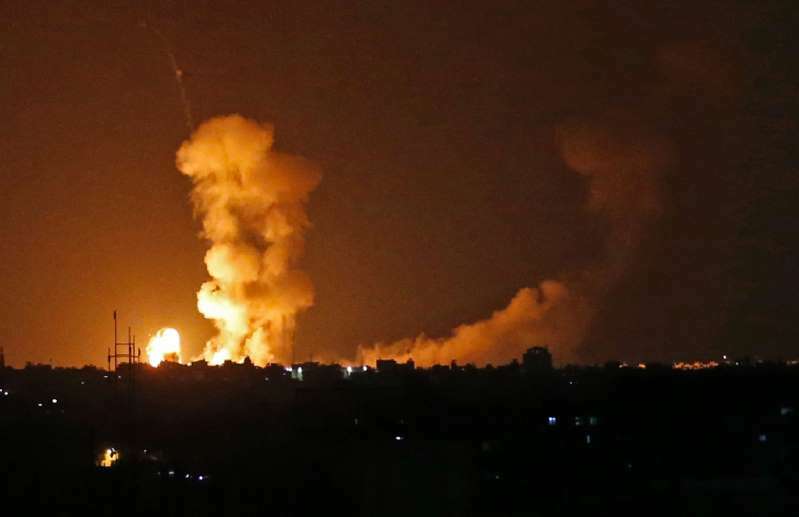 I know that the (Israeli) occupation is carrying out raids to pave the way with their home base," Somaya Rabaya, 21, from Deir al-Balah in central Gaza, told AFP. While the ceasefire deal included an end to rockets and mortars, it didn't include a commitment by Hamas to stop what Israeli media have dubbed "terror kites," a senior Hamas source said on condition of anonymity. [post_ads]During months of border protests, young Palestinians in Gaza have attached incendiary devices to kites and balloons and floated them over the largely sealed border, sparking hundreds of fires. Ofir Libstein, 44, lives with his wife and four sons in the Kfar Aza kibbutz near the border with northern Gaza. The land around their community has seen extensive damage caused by kites and balloons. "You see all the fire, all the trees, all the flowers, everything on fire," he said. He said no fires had been started near his home so far Saturday, but worried there could be later. The flare up in violence has also sent Israelis near Gaza repeatedly running for bomb shelters in recent weeks due to rockets and mortars fired by Palestinian militants. "It's scary, but this is life next to the Gaza Strip," Libstein said, pledging to remain. Israeli politicians have threatened tougher responses against the perpetrators of the firebombs in recent days, with the army targeting groups of young men releasing them near the border. On Saturday morning in Gaza, 17-year-old Wissam was with a number of other youths fitting kites with small bottles full of diesel, while sheltering behind a sandbank for fear of Israeli strikes. "This morning, they bombed a Hamas observation post near here. I was afraid they would hit us with a missile," he said. The border was largely quiet Saturday, but there have been months of major protests and clashes there, peaking on Fridays. At least 149 Palestinians have been killed since late March. Friday's death was the first Israeli killed. For Israel, the army is defending its borders and halting infiltrations. It accuses Hamas of using the protests as cover to carry out attacks. Palestinians and rights groups say unarmed protesters are being shot while posing no real threat to soldiers. People in Gaza also view the kite firebombs as legitimate resistance against Israel's blockade of the strip. In recent weeks, the situation has escalated. Last weekend saw the worst exchange of fire between Israel and Palestinian militants in Gaza since a 2014 war. Israeli strikes hit dozens of what the army described as military targets in Gaza. Some 200 rockets and mortars were also fired back at Israel from the territory. "We don't want a new war," said Khaled Barbakh, 22, from Khan Yunis in southern Gaza. "We are tired and want to live like humans," he added, referencing Israel's decade-long blockade. Israel says the blockade is necessary to isolate Hamas, with whom it has fought three wars with since 2008, most recently in 2014. Critics say it amounts to collective punishment of the strip's two million residents and leads to further radicalisation. While civilians remain wary of another conflict, if it were to start many would likely rally behind their leaders, Nathan Thrall of the International Crisis Group think-tank told AFP. "If a war broke out now, I suspect most would (be in favour)," Thrall said. "If it had broken out last night, Gazans would have supported Hamas retaliation and many Israelis would have supported Israeli action to try and stop the incendiary kites and balloons."